1. Connect your Facebook account to your GoFundMe Kickstarter Indiegogo YouCaring account. Validation increases the fund raising. A lot of people (before putting money) would like to know you is actually you. Do the same for all social networks, twitter, linkedin, etc. 2. Change your Facebook cover photo to a GoFundMe Kickstarter Indiegogo YouCaring ad. 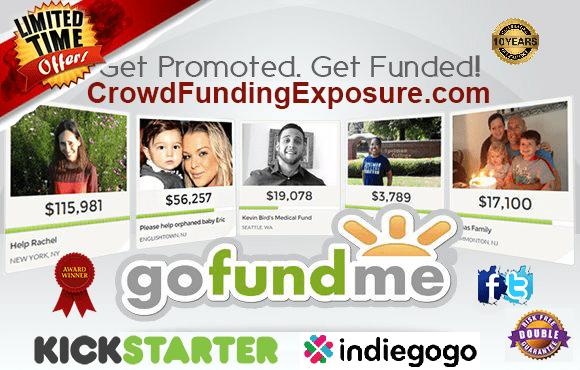 Use your GoFundMe Kickstarter Indiegogo YouCaring photo (+ logo) as your Facebook cover photo. Increase exposure: People need to be exposed ~3-4 times to your campaign before they pledge. Do the same for Twitter, Linkedin etc. Create a special section for your team in the campaign page and describe the team, who does what etc. More people on board means more funds. 4. Make sure someone already backed you up (even your mom). When people reach your campaign page and they see the zero funds you raised this is a #fail. Create some social proof and market validation by making sure you raised some money before people reach your campaign page. 5. Be direct with friends! If you ask from friends to share your campaign on thier wall, you will get social shares. If you ask from friends to back you up, you will raise funds. Be clear of what you ask for. 6. Ask for feedback from strangers. When you reach out to people and ask for their money, you automatically create discomfort. When you ask for feedback, people actually takes the time to examine your campaign. Listen to their feedback and ask what is needed to get their support. On average, people need to be exposed ~3-4 times to your campaign before they pledge (through facebook news feed, messages, etc.). This is the human nature. Keep a reasonable gap of about 7-10 days between each message/update. Do not spam. Only about 4% of your facebook friends actually see your facebook posts (and it is always the same 4%). Send a personal email message to each friend in order to increase exposure. This is best way to raise the first 10,000 USD. Make sure you notify your friends 3 days before your campaign ends “this is the *last* option to pledge”. Tendency to procrastinate is human. Your friends are human. Let them know it is now or never. Sharing your campaign with friends and family is what makes any crowd funding campaign work so well. Not only will the people in your life support your campaign, but they will also help spread the word to their friends as well. Only after sharing the campaign with your friends/family/fans and raising 5000 USD (at least) you can reach out to strangers.